The state in which you choose to live can play a big role in how far your paycheck stretches each month. Some states are just more expensive than others, forcing you to spend more of your paycheck on necessities. 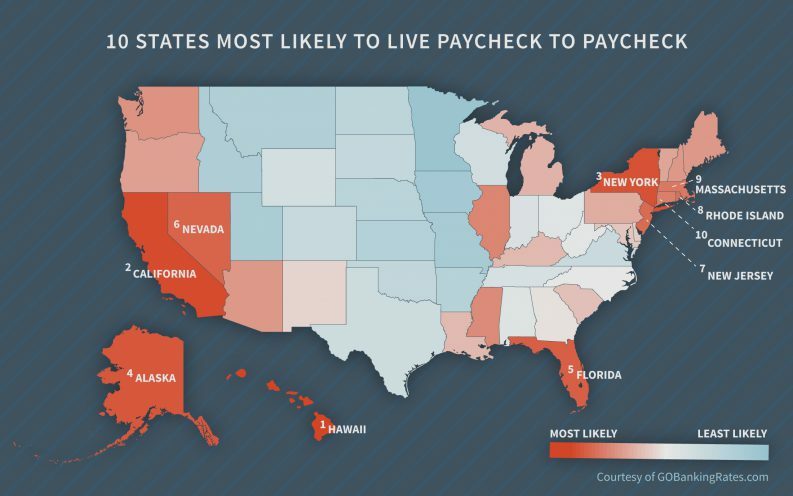 GOBankingRates has identified the best — and worst — states for avoiding a paycheck-to-paycheck existence. Data was collected to rank all 50 states in a range of categories, including median household income and the cost of housing, food, transportation, utilities, and healthcare. We crunched those numbers to see which states’ residents had the biggest portion of their paycheck left at the end of the month. Click through to see if you live in a state that’s kind on your income or one that stretches your budget too thin. There are certain states in the country where your paycheck just isn’t enough to make ends meet. The 10 states where you’re most likely to live payday to payday don’t necessarily have low median household incomes — in fact, a few states with some of the highest median incomes per paycheck in the nation made this list. It’s their high costs for things such as housing, utilities or transportation that eat up paychecks, suggesting that the incomes, though high compared with other states, are actually still disproportionate to the costs of living. To read the complete article, visit the personal finance website by GObankingrates.com.